Jesus made clear that He did not come to bring a sword of military power or political might. The sword that Christ brings is the sword that cuts in and divides righteousness from unrighteousness. It cuts to the quick of your own life to sever unholiness from holiness. First, prayer is efficacious. If someone will stand in the gap and lay hold of what it is that needs to be bridged, the power of God will make a complete circuit, and His intended purpose will be accomplished. The issue, of course, has nothing to do with the relative size of the person praying. The issue is our obedience and the exercise of our prayers in accordance with the revelation of God’s Word. It does require understanding, which breeds faith. And faith brings the results. They are not the results of a surge of emotional faith, but of the action of faith­—one that addresses the situation according to the Word, and believes God for breakthrough at a specific local, national, or international dimension. The average believer in Jesus Christ never learns to pray beyond the circle of their own personal or family needs. If you suggest they pray for something such as a national or an international issue, they may say, “Well, that would be nice, but it’s like praying, ‘Peace on Earth, good will toward men.’ It’s kind of a cross-your-fingers-and-hope.” They don’t have any real conviction that what they are doing makes a difference. The call, please notice, is not to the whole society; God says it’s to “My people”--to those of us who name the Savior. He is not saying that when the whole nation repents, He’ll show mercy; He speaking to you and me to repent of our own hearts or attitudes and pray. The promise stands good on Heaven’s side, awaiting our response. Faith is obeying God’s rule. Faith isn’t a feeling; faith is an action. When we pray, in obedience to the Word, there comes the eventual result unto His glory. The Lord is looking for people who will apply His Word to the matters they confront, as the Holy Spirit speaks to them about specific situations of local, national, and international implication. You and I have a biblical directive to pray for peace. Jesus was sent for the purpose of bringing peace, and He is called the Prince of Peace. But on this occasion, Jesus said He didn’t come to bring peace, but a sword. What was He talking about with these two conflicting things? Jesus made clear that He did not come to bring a sword of military power or political might. He refused the sword that Peter raised to His defense: “All who take the sword will perish by the sword” (Matthew 26:52). The sword that Christ brings is the sword that cuts in and divides righteousness from unrighteousness. It cuts to the quick of your own life to sever unholiness from holiness. It comes to confront the powers of darkness that, in the invisible realm, will hold all mankind at bay and do everything possible to kill life and steal joy. The book of Revelation tells us there is a sword that comes out of the mouth of the One who goes forth conquering (Revelation 19:13-15). And that sword is the Word of God. As the Church rises to speak the Word and to move in prayer in situation after situation, the sword of Christ begins to advance the conquering power of the Prince of Peace in the circumstances of a given family, city, culture, or nation. The first call to the Church (“first of all”) is to this dimension of prayer. There is not one ethnic group or nation outside the purview of this responsibility and privilege. The Bible says we are to pray “for all men.” But how can we pray for all mankind? Well, it isn’t by praying, “Dear God, please bless everybody on Earth. Thanks. Amen.” It is to pray as the Holy Spirit moves you into concern for given situations, and you address that situation in specifics. Maybe the situation comes to your mind while you are in prayer, and you don’t know why. Then Scripture goes on to say that we are to pray for all mankind by praying for the leadership in those lands: “for kings and all who are in authority.” That’s “all who are in authority,” at every dimension of leadership, and we are called to pray for them by God’s direction, not based on whether we like them or agree with their viewpoints. We’re told to pray. Period. Why? Because it will bring about a difference in the climate of our culture. Our prayers are called for in order that we might lead a “quiet and peaceable life in all godliness and reverence.” That’s both social and spiritual. It means people in that community or nation are happy because there is an order of freedom and a government that makes life livable. God wants people to enjoy life. And He wants them to enjoy it in His love and truth, and on the terms of His righteousness. People who live in the Lord’s righteousness do so not in a religious sense, but as people who are free, who are whole, and who love the Lord with all their hearts and their neighbors as themselves. In the climate created by intercessors, this remarkable fact will be fulfilled: more people will come to Christ. Our role as intercessors is not only for you and me to enjoy “quiet and peaceable” lives, but also for “all men to be saved.” That as we pray with passion, the Savior’s life, peace, and purpose would be fulfilled in the lives of others. God desires that. You and I have the power to decide the spiritual and social climate in the local community in which we live, and then beyond that to our state, our nation, and the world. This is our starting place as functioning agents of the Kingdom of God--to respond in faith to the Holy Spirit’s assignments, and to pray and invite Heaven’s rule into specific situations on Earth. Our prayers are indeed decisive. As the living Church of Jesus Christ, we are called to exercise the privilege of our role as intercessors-believing God’s promises, speaking His Word, and praying in faith to see social peace, justice, and spiritual opportunity manifest throughout our world. 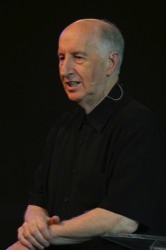 DR. JACK HAYFORD—serves as President of The King’s University (formerly The King’s College and Seminary) in Los Angeles, which he founded in 1997. From 2004 to 2009, he also served as President of The International Church of the Foursquare Gospel. He is probably best known, however, as “Pastor Jack,” founding pastor of The Church On The Way in Van Nuys, California, where he served as senior pastor for more than three decades. This Article is from Jack’s Book Praying For Those You Love.